If you have not already installed and configured Elastic APM, the Setup Instructions will get you started. After you install the Elastic APM agent library in your application, the application automatically appears in the APM UI in Kibana. No further configuration is required. 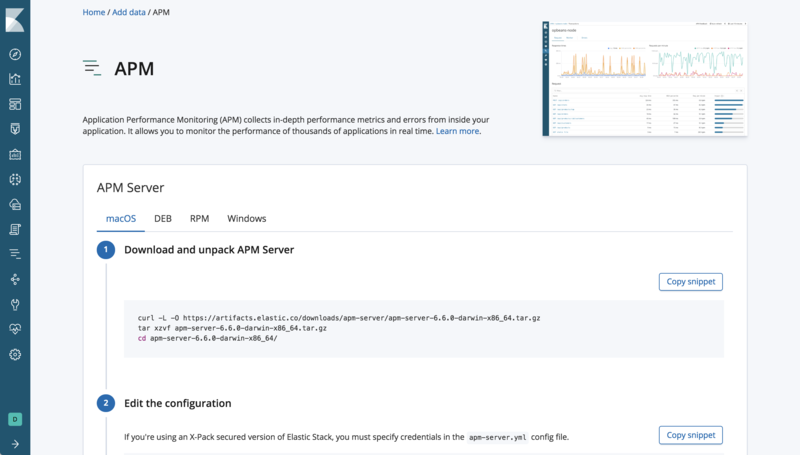 If you also use the Elastic Stack for logging and server-level metrics, you can import the APM dashboards that come with the APM Server. You can use these APM specific visualizations to correlate APM data with other data sources. To get the dashboards, click Load Kibana objects at the bottom of the Setup Instructions.